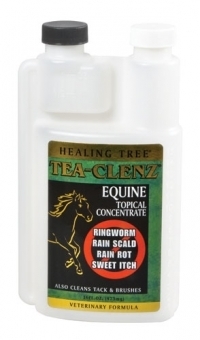 TEA-CLENZ® is a cationic, or non-sudsing, cleanser that in its properly diluted form is superb in the treatment of rainscald, rainrot, ringworm, summer sores, mud fever, girth itch, and other fungal and bacterial skin problems, especially those involving large areas of the horses body. TEA-CLENZ® is a concentrated, externally applied, Equine Body Wash and a must have for every tack room. Great Anti-Fungal treatment for your horses! Cleans tack and brushes too! • Makes Up to 16 Gallons/over 60 litres! This product is intended for mild cases of skin disease only. If the preparation fails to alleviate the condition being treated the user should seek veterinary advice. The best eCommerce software by ShopFactory powers P93. All-in one eCommerce and shopping cart software.